I’ve gotten quite a few requests for clarification about the Not Curly But Sort-Of Bendy hairstyle I described two weeks ago. For some reason, the brilliant bit of prose: “don’t open the “flappy”thing” confused a couple people. I mean, really. Anyway, funny story! I’d actually taken pictures of the technique with the idea of using them to illustrate the column. And then I completely forgot about them, as I chose to upload the column after approximately 70 glasses of wine. Here they are. Note: I am not wearing any makeup in these photos, and also, while I may have been in California, my eyebrow tweezers were in Washington, DC. Yikes. The Wednesday Advice Smackdown! Now with 27% More Helpful! In a few months my brother is getting married, and I have a shoe dilemma. My mother visited the vineyard where the ceremony is taking place and when she reported back to me she used terrifying words like “grass,” “soggy,” and “squishy.” This is disturbing for me because I already have a dress and shoes, and these shoes are of the 4-inch stiletto heel variety. Not so good on squishy grass. change into the heels for the reception, where the ground will be solid and the champagne will be flowing. But that is such an awful amount of work, and a spare pair of shoes won’t exactly fit into my black, satin clutch. Any advice? A miracle solution, perhaps? Stupid weddings. I can’t tell you how many times I get asked about what shoes to wear to weddings on beaches, in parks, bogs, quicksand, everything. I suppose you could wear flats to the ceremony and just keep your heels stashed in whatever vehicle you will be taking, but far be it from me to ever tell anyone to be practical and miss out on the opportunity to buy NEW SHOES. Also: cankles. No! Black dressy wedges with a solid black heel DO exist, and I think they’d look awesome with that dress (thanks for the picture! pretty!) and make you look remarkably unstumplike. However, whenever you wear black shoes outside, in evil nature, they’re going to get all cruddy. Particularly if you’re dealing with squishy grass. So I would pack a few wet wipes in that little black satin clutch so you can discreetly clean them up without having to make a big paper-towel-and-hand-soap production in the ladies’ room. I have gotten myself in a pickle……I’m in over my head with Highlights that I cannot afford to maintain. My natural hair is baby fine & a dark dishwater blonde — mousy and plain so I get a few face framing highlights to brighten my complexion and add body. I went to an Aveda beauty school to save some money ( we just adopted our toddler from Russia) and this chick put two different colors in my hair and now it’s way so blonde and over-higlighted. Its nowhere near my natural color– except in the back. This look probably looks good on a 20something- but I’m in my late 30’s and I’m so distraught. I went to a new place (high end/ well known salon) to get some lowlights to try to blend — but its still too blonde for my fair & freckled complexion. I waited a few months and when it got really rooty I went back and this time they tried to make it look cool blonde instead of warm blonde and it’s still all wrong for me. Now what do I do? Should I ask the salon to color me all over? How do I get back to natural? I hate roots and every 6-8 weeks I start getting really bad regrowth …I’m stuck in a catch-22 of highlighting hell. I can’t afford to keep this up. Oh bleh. Getting your natural color back. It sounds so simple, doesn’t it? For the record, I don’t think your hair looks nearly as bad as your email makes it sound (thanks for the pictures! infinitely helpful!). Yes, it’s a little too pale for you. But the real clincher in the cost to keep it up, and honestly, paying to maintain a color that you DON’T EVEN LIKE is the saddest thing ever. So I get why you’re upset. Yes, I think the best option would be getting an all-over, single-process dye job at the salon. A home dye might work, but picking the right shade is fraught with potential disaster. You might be able to do it if you get some guidance from a veteran homecolorer (colorister? dyejober? what?) since you’re looking to go darker (blond home dyes over darker dye? aaahh! no!! ), but to be absolutely safe I’d probably just go to a salon. You’ll want to go to the salon with some significant roots, however, so the colorist can get a good look at your natural color and determine exactly what dye numbers were used on you before. I’d say about two inches of regrowth would be best. Make sure you tell them about the Aveda-highlights-before-your-current-highlights so they’ll know what they’re dealing with. Get a trim of those sure-to-be-ridiculously-overprocessed ends at the same time. And then be very nice to your hair afterwards. You’ve colored it a lot and you’ll probably see some breakage for awhile. Do a weekly hot oil treatment if you can, and maybe take some of the highlight money you’ll be saving in the long run and invest in a good shampoo and conditioner. (1) I have fair skin and a red nose that Santa would envy. Is a good color correcting foundation primer worth the money? I’ve tried the cheap ones, and they don’t seem very effective. Any suggestions on how to even my skin tone and hide the red? (2) I’ve been an at-home mom for a few years now, and I’ve let myself go. I keep hoping that bag-lady couture will come into style, but so far, no luck. I know you’re an at-home mom as well, and know the realities of having 10 minutes during the Boobahs to complete your entire beauty regime, so what is your daily routine? What do you wear, typically? How much do you do to your hair? Do you floss and whiten your teeth, or just brush? What do you put on your face? I figure if I model myself after you, no one can accuse me of being frumpy. As for the second part…oh. Dear. My daily routine is not so much “routine” as a “desperate, hurried scramble.” Typically, I try to at least 1) shower, 2) shave my armpits, 3) brush my teeth and 4) put clothes on. If I accomplish all four, I declare the day a raging success. Yesterday those four items were not completed until 3 pm, but still. Success. Raging. I let my hair air-dry, obviously. I use a detangler, comb it through, and then I use a thickening spray or curl booster. Other than a few scrunches as it dries and some lifting at the roots, that’s pretty much all I do. Probably four days out of five it ends up piled up into a clip with my bangs snapped back in a barrette. It’s a rockin’ look. I wash my face in the shower, then I moisturize. I smear on some eye cream, oil control lotion, powder and usually leave it at that. If I have to run an errand, I’ll apply foundation and mascara but rarely anything else. Oh, but I always comb my eyebrows. You know how I feel about neat eyebrows. I wear jeans and a couple layered tank tops most days. If I’m feeling especially put-together, I’ll add a belt and a pair of stud earrings. Other days, it’s all yoga pants. Because really, I just want to be comfortable. I love my Levis and my cotton tanks. I guess it’s a pretty boring Slobbish Mom Look, but I don’t know. I think it’s kind of cute. And comfortable. Did I mention the comfortable? HowEVER, the rule at our house is that on the weekends, I get to pamper myself all I want. If I want to take an hour to blowdry my hair and use a face masque and apply everything from Vitamin C powder to eyeshadow primer, I’m going to. Jason spends time with Noah in the morning while I take a long shower, shave my legs, deep condition my hair, and then spend forever futzing around with my cuticles. I have red skin and I LOVE the Smashbox color correcting primer. I just got some this weekend and it is great. Plus, I really like the foundation they sold me too. Must. Have. Deep. Conditioner. Link. Capello – I’ve been using Bumble & Bumble’s Deeeep Conditioner, but I’m actually not in love with it and am looking for a new one. Anyone? Deep conditioner? For fine, colored hair prone to tangles and split ends? Thanks for the tip on the primer; I could definitely use some help in the red nose department! Quick question, though – what is the advantage of using the apricot primer for undereye circles as opposed to a regular concealer? I’m currently using the MAC Select Cover-Up (NW20) for that purpose, for what it’s worth. I’ve recently fallen for the Biolage Conditioning Balm. Not having had good experience with Matrix products in the past, I was surprised at how much I loved the Biolage. Thank you free samples! Oh, they also make another deep conditioning treatment that might work better if your hair is super-duper fried. Although, my hair is highlighted, flat-ironed, and was once chemically straightenend and I am STILL satisfied with the “regular” conditioning balm. Hey! 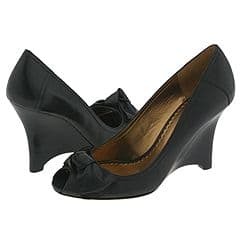 I’m buying myself some new fancy black wedges. Wheeee. And since you love the purity so much, did you know that Nordstrom had giant, costco sized bottles on SALE?? For all of you ladies who are describing the red nose and cheeks, have you ever heard of a skin disorder called Rosacea? I know of it because my mom has the “bright red nose that Santa would envy” too, and she didn’t learn about the cause of it before the damage was irreversible. You can find info on it at http://www.rosacea.org/index.php and I would also recommend at least talking with your regular doctor if you can’t swing a dermatologist. I’m a low maintenance makeup person myself (and I don’t even have kids yet). I don’t wear foundation but for a color-evener (yes, that’s a technical term), I really like Benefit’s Get Even. Since it is a little pricey & there’s no Sephora nearby, don’t use it as often but still like it. I just went and bought the smashbox primer and it is heaven! (i got it at a dept store for the same price, btw.) thanks for recommending it, amy. it’s my new favorite thing. i also got some of their eyeshadow. i have allergies and it hasn’t bothered my eyes one bit today. yay! I have to say? The Bendy Hair Style System? TOTALLY ROCKS!! My hair has never looked so good with so little effort. Well, it’s more effort than usual, which is almost none, but we get back what we put into things, don’t we? Anyway.